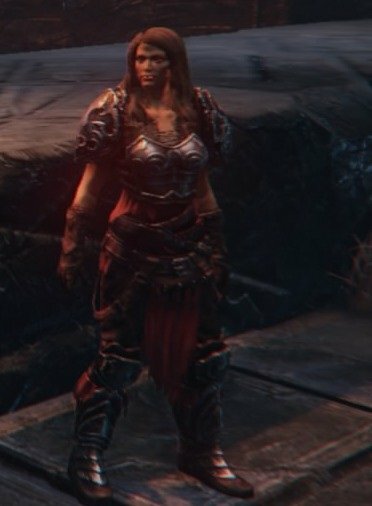 Yetka is an NPCs you face in Lords of the Fallen. Found in the Southern Wall area of the Monastery, she is holding down a monk when Harkyn intervenes. She claims the monks stole her family valuables. Drop him: Monk Dies. Can converse with her about her intentions. Don't drop him: The Monk lives. Can converse with her about her intentions. Before entering the Commander boss gate, she asks you if you have seen a special dagger. She claims to have a key to a secret entrance in the monastery Catacombs. Upon retrieving Yetka's Dagger and giving it to her, she will give you the Key to Catacombs. In front of the pathway to the Rhogar Abandoned Temple , after beating Worshiper Boss at graveyard. By going through the portal she will follow along. Before the big gate at the arena , she will ask for you to look for ancient Tablets. Collect all 5 to get some shards from her. Once you enter the portal to the Rhogar dimension after defeating the Beast, she will appear right after the starting bridge, and will ask you to ignore the boss right ahead and follow her. Once you follow her back to the arena for the Infiltrator, through the Western Antechamber, you'll find her in front of the magic seal you can disable with your gauntlet. Once you do and proceed a bit further, you'll enter a room with floating slabs. She'll tell you to open the gate she's standing near, which you do by using a lever at the top of the tower you are in. Enter the Chamber of Lies on her side, and pull the lever that's overlooking the giant monster. At that point, you can't do anything else in that side of the Chamber of Lies, then you leave and go back to kill the Guardian, and enter the main entrance of the Chamber, and she'll be right next to some wall writing on the left as you enter. She'll then give you all 5 Old Religion Audio Logs, and the Stone of Divine Understanding, which will allow you to read the four wall messages you'll see in the Rhogar dimension. After recieving the Audio Logs and the Stone of Divine Understanding processed to the giant monster and you'll get a cut scene. If you let the giant monster live the Yetka and the giant monster will vanish and the trophy will pop. If you fight the Guardian before doing all of that, she'll never show up inside the Chamber, to give you the Stone or the Logs, and will just stand near the gate you have already opened for the rest of the game. After using a lever on a top of a tower, she is still standing before it. Any ideas?